I bought The Burning Sky after Kelly and Alexa raved about it, but I kept putting off reading it. Something about it didn't totally appeal to me, but I trusted that they wouldn't lead me astray. Thankfully, they were completely right to push the book on me. I loved it! I was immediately drawn in to the world Thomas created, and I was fascinated by the combination of historical fiction and fantasy. I couldn't believe I hadn't read it sooner! As soon as I finished that book, I dove right in to The Perilous Sea. Of all three books in the series, it's my absolute favorite. It took everything I loved about the first book and made it that much better! 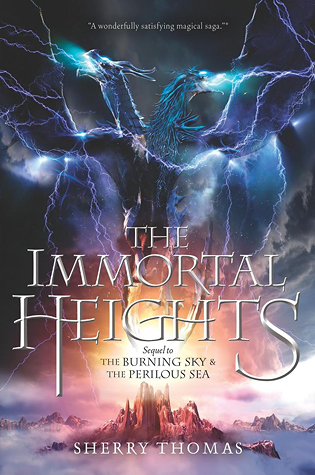 So, I was thrilled when I was approved to read The Immortal Heights. But I accidentally waited too long to read it and my excitement died down a bit. Hoping to recapture the magic and anticipation, I decided to re-read the first two books (in the same year I first read them!) before diving in to this conclusion. I was ready to see how it would all end, even though I dreaded saying goodbye. So, how was it everything I hoped for and more? In some ways, yes... and in others, not quite. While I thoroughly enjoyed the series, this book was my least favorite of the three. I'd attribute that to two minor things and two larger issues. I'll start with the more minor things. First, something felt off at the very beginning of the book. I could never quite put my finger on it, but the tone and/or the writing just seemed so different. I was having a hard time getting in to the story! Second, I missed some of the humor and banter that had been so character of Titus and Iolanthe's relationship in the previous books - though I probably shouldn't expect repartee in the middle of battle. BUT STILL. My biggest frustration with the book was that there was one element of the plot that was very anticlimactic. For all the time that was spent setting up an epic showdown, it just didn't deliver for me. I won't say more for fear of spoilers, but if you've been reading this series you probably know what it's been building towards. My other issue was that there seemed to be more information dumps in this book than in the previous two. I liked the use of footnotes earlier in the series because they allowed for more background information without interrupting the flow of the story, but they were barely utilized in this book (or maybe I just noticed more moments that felt like too much telling rather than showing). Maybe that's what felt off to me about the writing? However, all that being said, I really don't think fans of the series will be seriously disappointed with this conclusion. I wasn't! I was pleased with pacing, especially since the book was action-packed and full of adventure. The characters are still my favorite part of the series, and I love the romance (and friendship) between Titus and Iolanthe. There's been such consistent growth between these two, and I love the way they support one another. There were some new (and old) secondary characters that also took on a more prominent role in the story, and I enjoyed every minute spent with them! I was still emotionally engaged in the story, and I'm generally pleased with the way it ended. I wish this had been my favorite book of the three, but I'm still happy that I read The Immortal Heights - and that my friends convinced me to take a chance on this series! I've been impressed with Thomas' creativity and characterizations, and I look forward to reading more from her in the future. If you're a fan of fantasy with a great love story, The Elemental Trilogy just might be for you! "You have been all my moments of grace." I'm still SO pleased that you read this series, Hannah! It's really quite brilliantly done, and I think it's something that all YA fantasy fans should check out. 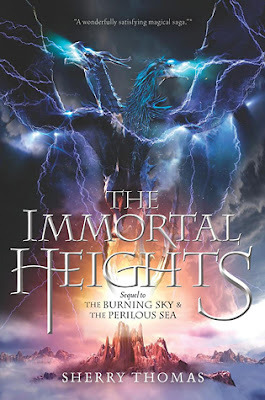 Like you, The Immortal Heights isn't my particular favorite of the series, but I like how things are wrapped up and, of course, I love Iolanthe and Titus!